For photographers, theatre tech crews and many other folks, gaff tape is what holds the universe together. Not duct tape. Gaff tape, for those of you who may not be familiar with this essential item, is like duct tape but better. It’s a strong adhesive tape and can be ripped easily at 90-degree angles. Unlike duct tape, it doesn’t leave a residue, and its backing is a durable cotton cloth. Whenever I’ve had to borrow gaff tape, it was often either to tape ripped-up garbage bags around my equipment to protect it from rain or to secure a loose lens hood. As of last week, I finally have my own gaff tape. How have I used it so far? Leaving notes for people. The first time was when a reporter and I knocked on the front door of a homicide victim’s family and received no answer. The reporter wrote a note to slip under the door; I offered some gaff tape. The second time was today at the Pennsylvania Farm Show (about which I’ll blog in more detail later). 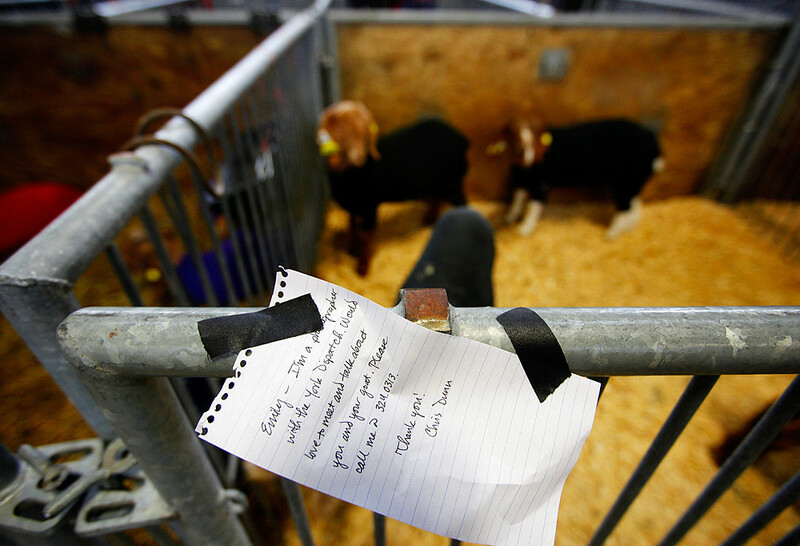 Trying to find people from York County at what’s basically a big state fair on opening day was pretty difficult — but eventually I did get in touch with Emily (through other means) and receive a call from another girl for whom I also left a note. Thank you, gaff tape. So glad I finally have you in my life. Erin, there were so, so, so many goats there. You would have died of happiness on the spot.